Australia Gliders go 3-0 and stay undefeated at the Nations Cup Cologne with a 72-42 win over the Spanish women this morning. There will be a change of starting line-ups for both Spain and Australia in the opening match at the Nations Cup Cologne. 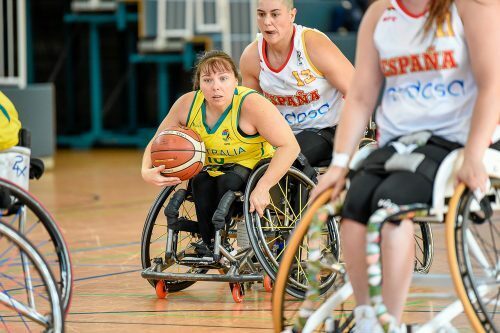 However, in the last few minutes of the period, the Spanish women found themselves in a team foul trouble and Australia went on a 13-point unanswered to end the first period 19 – 8 up. The second quarter of the year was over, and the second half of the day was over. Australia are they going to dominate the quarter 20 – 5 and extending their lead to 27 points. A vocal spanish bench buoyed their team in the fourth, who continued to fight and kept the score to within three, 13 – 10 the closest quarter of the game. Final scores 72 – 42. The victory for Australia means the match between Australia vs Germany at 14.00 will be the women’s competition winner decider. Spain’s Vicky Vilarino Alonso scored a high score of 23 points, whilst again Australia’s scoring was spread with four players hitting double figures.